When I was a boy I spent most of my time in the summer at my grandparent’s home in southern Colorado, usually in the company of several cousins. There was an old- fashioned root cellar under the house which contained many treasures; among these we found a magnificent sword and scabbard incised with regimental designs, a finely tooled object so out of keeping with the simple, unadorned furnishings otherwise to be found in the house above. I shouldered my way through teenaged years during the height of another American war, the Vietnam War. Another war over which the people were evenly, and bitterly, divided. At school, in the church, in the grocery store—a “civil war” of distemper, fighting hard to preserve illusions of greatness, the mother-lode of all that limps along under the contentious notion of “American exceptionalism.” The “elders” of my generation thought that a universal military draft was still a good idea, and so every young man was obliged to register and thus tacitly and actively agree that the current war was also a good idea. I myself was relieved of those pressures by default through a surprising failure to pass a routine military physical exam–a skeletal deformity until then unsuspected, leaving me in the then rare position of not having to choose for or against the chosen madness of the day. Forty years later I found myself living as an expatriate outside of the borders of the U.S.A., where for the first time I found myself living amongst a people looking into America with an easy irony that matched my own, but without the memory of the bitter solvent of the hazards of opposition to the war and all that led to that war, and to all wars. Conclusive bitter ironies leading to a lifetime as an outsider on the inside. To be away from all of that confusion between the inside and the outside, more or less permanently, was and is a relief to me. This painting, which I am calling “The Sword of Consequence” represents my final tribute, my last “love note” to the Nation of my birth and early life, but one that doesn’t forget the cascade of bitterness and grief and disillusion that the late Twentieth and early Twenty-first centuries have wrought in my own soul and in that of many others in regard to the “clay feet” of the Golden Statue which is the USA and the slowly dying culture of empire and capital. 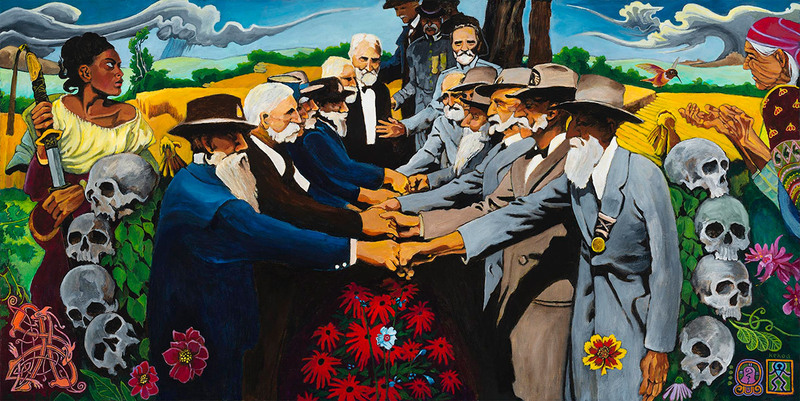 At Gettysburg, around 1910, there was a battlefield reunion of surviving veterans from both sides, North and South together. All my life I have carried a small, tattered black and white news photo of one climatic moment that took place during the reunion when veterans met each on their own side of the stone wall that represented the high tide of Southern advance (General Pickett’s division) at Gettysburg, and reached across, each taking the hand of the man across from him. There is still something about these old men that moves me–I can’t really explain it. A sincere gesture of reconciliation that barely suffices to meet the griefs of the past and the fractures of the present, in which it is not too much to say that the American civil war continues, by subterranean passageways into what may to all appearances be thoroughly modern disputes, shorn of Manifest Destiny and all it’s rages. And of course it continues by exportation and projection all around the world. I never thought I’d find myself in a position to make a statement about all of this, and about what I saw in that little photo; but I was fortunate to live long enough and so here it is.